One of the course goals is to “provide a "sense of place" and an understanding of the unique ecological features of the environment of which you are a part”. This relates to the earth charter because the earth is the foundation of everyone’s sense of place in this world. Without the earth there would be no place to find your sense of place. The earth charters goal is to get all humans to come together to start treating this earth with the respect it needs to survive the years ahead. The earth charter aims to help future generations find their sense of place just like we were or are able to find ours. Throughout my time in this course certain experience have definitely helped me find a better sense of place in this world. The field trips we have taken, especially our most recent one to the ECHO farm, have really made me look at life differently and actually made me redefine what “sense of place” means. I’ve never been so out of my element in my life than I was when I was at the ECHO farm. Everything there fascinated me. The different ways to pump fresh water, make food, and survive on the land. The air there was so fresh. They really utilize the land in a positive way instead of tearing it apart to build more tall buildings and make more fake food. Another one of the course goals in this class is “to assist in developing an ecological perspective and a commitment to community awareness and involvement in order for students to know the issues related to economic, social, and ecological sustainability, analyze and evaluate ecological issues locally and globally, participate in projects requiring awareness and/or analysis of ecological and environmental issues.” I really believe this class does achieve that goal. It’s easy for people to tell me how badly humans are affecting the planet, but it’s another to be able to take all these field trips to places I wouldn’t go to on my own and be exposed to so many different sides of life and see places through different perspectives while hearing so many different views and opinions. I’ve changed my mind about this class. I was dreading taking it, but now I’m actually enjoying going to class! Especially when there are field trips. I can honestly say that seeing the passion my professor, and my many field trip tour guides have had has made me find my only little passion for protecting the planet we all live on and love. The Earth charter relates to my interests in some ways. My major and passion is resort and hospitality management and event management. This class has related to my interests by showing me how important it is to be environmentally conscious in every area of life. When I plan events I will make sure to have “green events” and reduce my waste as much as possible. I really believe this is even more important now that I’ve been expose to many different eye-opening experiences through this class. I chose the Gulf coast humane society because I’m passionate about animals. I love dogs, and cats, and I want to make my service learning hours meaningful not only to myself, but the local community. I really believe that volunteering here gives you perspective on what is important. These dogs deserve love just as much as dogs who have homes. 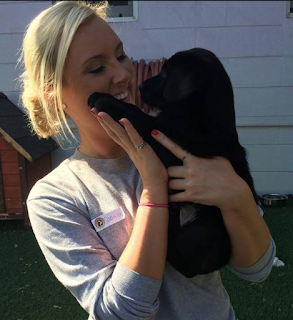 This is a photo of me at The Gulf Coast Humane Society with one of the rescued puppies, I hung out with him for a couple hours and it made us both feel a little happier.